Always measure and cut from a perfectly straight edge. To straighten the edge in a glass curtain pull a thread and cut along this. Be careful, however, if you are not accustomed to sewing, that you don't end up by making a wide tear in your fabric. If this first thread does not appear to be a straight edge, don't keep trying; it is safer to mark your line with tape pinned to the material and to keep measuring as you go along. Be sure your scissors are sharp, to avoid pulling threads. Cut the selvage off, as this material shrinks faster than the rest, and will tend to draw the fabric to the edges. Sew your side hems first, before finishing top and bottom. Hems at the side can be narrow, although currently it is fashionable to have at least 1 inch for large windows. It is also customary to make those hems of each panel that meet at the center o the window facing one another, at least 1 inch wide. Double stitching at the side hems insures long wear. For wide hems, turn the raw edge under one quarter inch, and crease, measuring every few inches to make certain the hem is even. Pinch, baste and then hem. Go through the same steps with your bottom hem. When you have your bottom hems basted do not sew to the edge where the two hems overlap. Instead, pull out the loose triangular piece left at the corner, pin it on the diagonal, and cut above the pin, leaving just enough on each side of the seam to turn under. Sew the turned-over edge, starting at the lower edge and sewing toward the center. This is what is known as a mitered corner. Allow a double turn of material for very sheer fabrics. If you need weights in the bottom of your curtains, the recommended kinds are the round string weights, and they can be laid along the bottom, tacked on behind the hem. Several alternatives are possible for the top hem of your glass curtain. 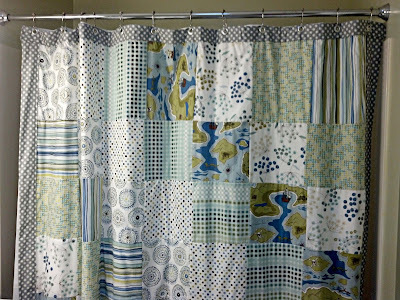 First, if yours is a tailored curtain, you may want just a plain casing for the rod to slip through. Allow enough material for the rod to slip in and out easily. And if you intend to attach the curtain to a brass pole, as in a sash curtain, with small brass rings, a simple, wide hem, 1 to 2 inches, will do. Or you may want a plain heading with a plain casing. For this make a simple hem with open ends. Double your line of stitches on your side hems to prevent the stitches pulling out. Take a tuck on the wrong side of the curtain, just under the casing, for your shrinkage allowance, and if your allowance for shrinkage is large, divide the total sum in half and put half at the bottom hem in the same way, on the wrong side, just above the hem. Use basting stitches for the tuck. If you are making a heading and casing in ruffled curtains, extend the stitching through the ruffles. If your material is too pliable or your heading is too wide to stand up by itself, then you may want to add some buckram or crinoline to stiffen it. Draw a thread on the stiffening and cut along it, making the stiffening slightly less than the finished width of the curtain. Lay it along the top edge of the heading and fold over, folding the sides in two to make them equalize with the width of the side hems. Stitch the heading and stiffening at the top and then fold over and stitch at the bottom of the stiffening again. This time you will be stitching in the stiffening and at the same time making the seam that divides heading and casing. Another possible heading for glass curtains is to make a series of rows of fine shirring, and then hang the curtains from the back with small brass rings attached to the back. This makes the heading stand out a little, and if you cord your shirring it gives a pleasingly stiff impression. If you are using a sewing machine you can get an attachment such as the Singer gathering foot, which pushes the fabric into even folds under the needle for this work; if you are sewing by hand use fine running stitches, spacing even rows. To make corded shirring, another attachment is useful, the cording foot, which makes it possible to stitch close to a raised surface. Crease or baste evenly-spaced rows across the fabric and lay a cord along the creased line on the wrong side, folding the material over it and stitching close to the cord. 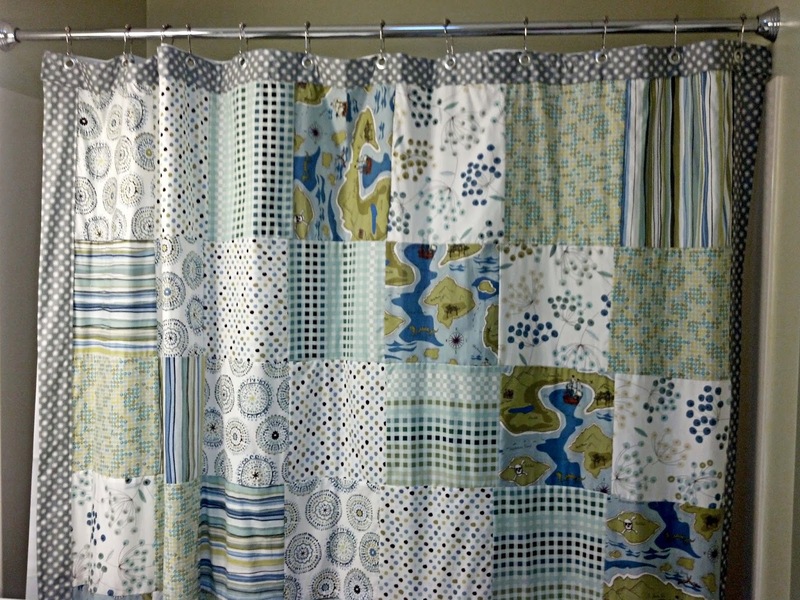 For either the plain shirring or the corded shirring, the procedure is the same: make a group of three or more rows of shirring, at least 1 inch from top of curtain, then skip about 2% inches, fold, make more rows of shirring, and fold over so that the two groups are even and can be stitched together. 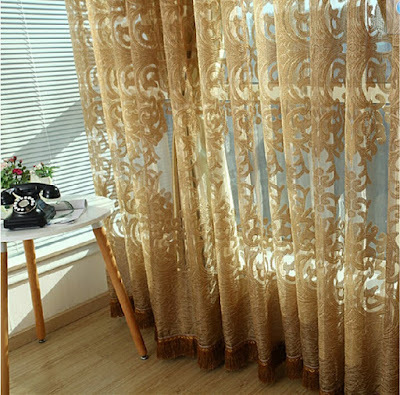 In glass curtains various types of fancy stitching are often used at the hem or heading, as particularly with simple gauzes and muslins they are felt to add to the effect of the material. Currently, however, with the vogue for straight hanging, softly-tailored styles, an even hem or double bottom hem with, perhaps, a soft ruffle at the top, is sufficient, and the beauty of the curtain lies rather in the color and texture of the fabric than in any applied ornamentation. But there is still room for hemstitching and Italian hemstitching in informal Provincial rooms, and this type of needle-work in threads of contrasting color provides a gay detail. A plain woven fabric is necessary for hemstitching since it depends on the cross-hatch pattern of the weave. You begin by pulling out about 5 parallel woof (horizontal) threads. Sometimes in pulling a thread you may have to prick at it with your needle as you go across the length of your material, and you should be careful not to get careless and make a hole. Then, beginning at the left, fasten your thread to the top of the hem by sewing the hem and body of the curtain together. Catch up several of the vertical (warp) threads (some four or five) starting with the furthest thread and coming back towards the left, and fasten this stitch by stitching a bit of the curtain and hem together. The Italian hemstitch is one in which you pull your thread in two directions, leaving some untouched, solid fabric in between. 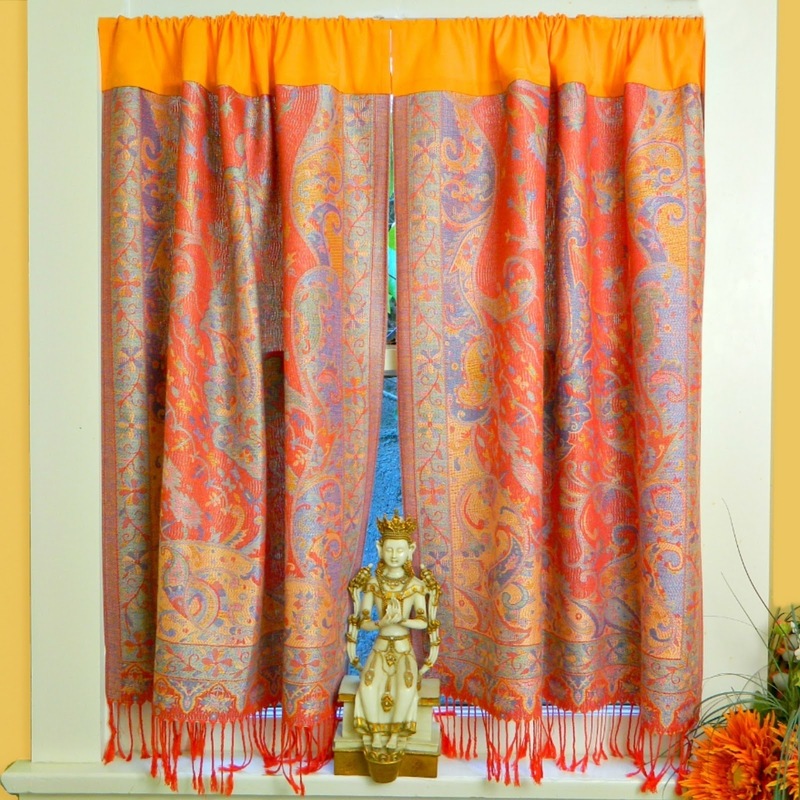 Next in popularity to straight-tailored glass curtains are Priscillas, or looped back, ruffled, cottagy-looking curtains. Ruffles may also, of course, be used as trim for the straight-hung types. Whiles ruffles may be bought by the yard ready-made, they are easy to make, particularly with a sewing machine attachment that both gathers and pleats. Generally the more sheer the fabric, the fuller the ruffle should be. It is considered proper to cut strips for ruffles the length of the material, since crosswise ruffles eventually lose their stiffness. This also eliminates the problem of seams. But for pleated ruffles it is necessary to cut on the crosswise thread. The Singer Company makes the suggestion that when using the Singer ruffler it is wise to test this attachment with a scrap of your fabric and adjust it to gather up just the amount of fullness you wish. Figure on having 3 times the length of your finished raffle for a moderately full ruffle. It is customary to hem the edges of ruffles. For an even, narrow hem, effective in a sheer fabric, use a flange hemmer, if sewing by machine. To apply ruffles to the curtain, stitch them to the first row of stitching on the hem. Crowd the gathers up slightly at the corners. This results in a heading, or row of gathered tucks, on the portion of curtain which overlaps the ruffle overlapping the curtain. To attach a ruffle without a heading, stitch it to the curtain, placing the wrong sides together as for a French seam, turn the material over the seam, bring the right sides together, and stitch on the wrong side through the first row of stitching. Double rows of ruffles are very feminine and pleasing, and if the ruffles are narrow, as many as five rows may be used. Buy Curtains online for the best product ranges for you.Shop at homedrape.com,Here we the latest trends of Bags for low prices.